The UK is comfortably on course to meet an EU target to reduce the amount of biodegradable municipal waste (BMW) it sends to landfill, government figures published yesterday (25 August) show. The data, which has been submitted to the European Commission outlines the UK’s progress towards the targets set out in the Waste Framework, Packaging and Packaging Waste and Landfill Directives. Figures originally submitted to the Commission in December suggested that the UK will struggle to meet the EU’s 50% by 2020 recycling target, with data for 2014 indicating that an overall recycling rate of 44.9% was recorded for the year (see letsrecycle.com story). This represented an improvement of 0.8% when compared to 2013. According to yesterday’s data update, a total of 8.7 million tonnes of BMW was sent to landfill in 2014. Under the Landfill Directive, EU Member States are required to send no more than 35% of the volume of bio-municipal waste to landfill than they did during 1995 by 2020. The UK’s 2020 target for BMW to landfill is around 12,490,000 tonnes – which it is comfortably on course to meet, having only sent a total of 8,652,000 tonnes of BMW to landfill in 2014. 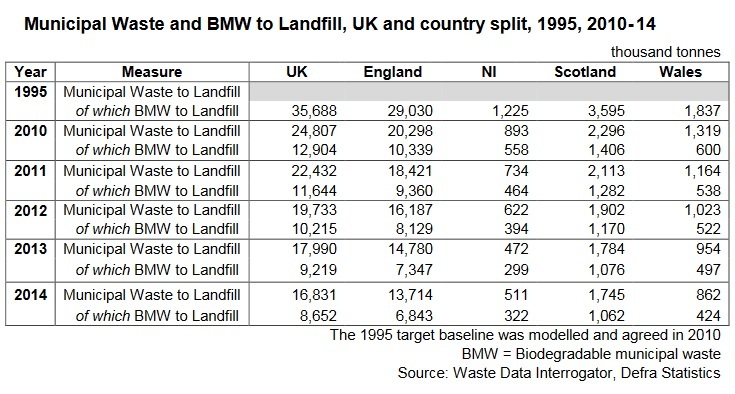 Targets to reduce BMW to landfill to 75% below the baseline level by 2010, and 50% by 2013 were also comfortably met by the UK. 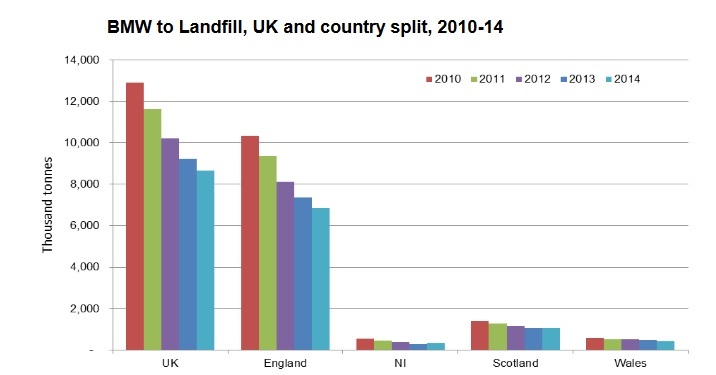 Whilst progress towards landfill reduction targets is to be welcomed, the figures again underscore the need for greater focus on meeting recycling targets – with the potential threat of fines from the European Commission to be handed to Member States, should these goals not be met. Progress on recycling has been under intense scrutiny this week, with the BBC highlighting an increase in reject rates from household recycling (see letsrecycle.com). Article published on www.letsrecycle.com on 26th August 2016.